With swashbuckling action that recalls Dumas's Three Musketeers , Sebastien de Castell has created a dynamic new fantasy series. 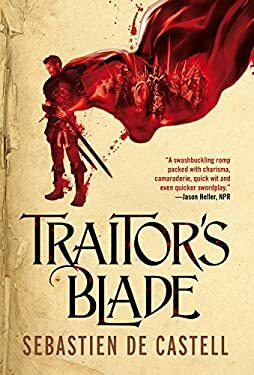 In Traitor's Blade , a disgraced swordsman struggles to redeem himself by protecting a young girl caught in the web of a royal conspiracy. The King is dead, the Greatcoats have been disbanded, and Falcio Val Mond and his fellow magistrates Kest and Brasti have been reduced to working as bodyguards for a nobleman who refuses to pay them. Things could be worse, of course. Their employer could be lying dead on the floor while they are forced to watch the killer plant evidence framing them for the murder. Oh wait, that's exactly what's happening. Now a royal conspiracy is about to unfold in the most corrupt city in the world. A carefully orchestrated series of murders that began with the overthrow of an idealistic young king will end with the death of an orphaned girl and the ruin of everything that Falcio, Kest, and Brasti have fought for. But if the trio want to foil the conspiracy, save the girl, and reunite the Greatcoats, they'll have to do it with nothing but the tattered coats on their backs and the swords in their hands, because these days every noble is a tyrant, every knight is a thug, and the only thing you can really trust is a traitor's blade.